Women in the Church is divided into two halves. The first half gives historical context to positions taken by various participants in the discussion on women's roles. Osburn categorizes these participants in four groups. On a spectrum from right to left, they are hierarchicalists, hierarchical complementarians, evangelical feminists, and radical feminists (Osburn's terms). Osburn discards as gently as possible both radical ends of the spectrum, wishing to address moderate participants—radicalists from either end are likely to disagree vehemently with the author anyway. Instead, he encourages moderates on both sides of the debate to admit the things they have in common (such as a high view of Scripture) but also be willing to admit when cherished interpretations of certain Scriptures may not be accurate. This goal informs the second half of the book, which examines key Scripture passages in detail and explains how each camp handles the passage. Osburn strives to be completely objective in these discussions and, compared to other authors, has probably done the best job of attaining this goal. Readers should be aware that he sometimes disagrees with popular viewpoints held by both sides, including some commonly held by CBE authors. Osburn keeps his disagreements civil, though readers not used to academic debates may find his critiques a bit harsh. In fact, in many places the book feels as much like Osburn's response to his fellow academics and authors as addressed to a "lay" audience. Still, the book is a thorough study of the Scriptures on which the debates about women's roles hinge. One could easily select a chapter about an important passage and discuss it with a complementarian (or maybe even a hierarchicalist). 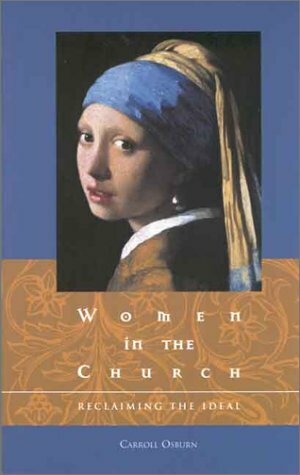 Women in the Church has value in that it is so scholarly sound and because it demonstrates to critics that egalitarians are committed to a high view of Scripture. I will return to this text often. I may even bring myself to share a chapter or two with traditional friends and family members. Cheryl L. Kester is the director of grants and foundation relations at John Brown University, Siloam Springs, AR.